The SRM650 1600W High-Definition Powered Loudspeaker deliver a new level of SRM ruggedness, output, clarity, simplicity and unmatched bass response, ideal as a main or monitor. Professional 10 FT XLR Cable Included. Steel Mesh Grill. On/Off Switch. Rugged Metal Construction. Beautiful Black Finish (The perfect combination of matte and shiny black finish). Super Cardiod Polar Pattern. Impedance 600 Ohm ±5%. Sensitivity -60dB ± 3dB (0dB=1V/Pa at 1KHz). Mackie SRM650 High-Definition Powered PA Speaker. Power Rating: 1600 Watts Peak / 800 Watts RMS. 1600W system power paired with custom transducers deliver gig-level volumes with room to spare . 15" high-output LF driver / 1.4" titanium dome. compression driver. "Built-Like-A-Tank" all-wood, internally braced cabinet delivers professional-grade road-worthiness . Rugged 18-gauge steel grille and fine-textured,. sleek black cabinet finish. Front ported for maximum low-end extension. and punch. Rockville DJ1500 DJ Headphones w/ Detachable Coil Cable, Case+Extra Ear Pad . Professional DJ Headphones . 40mm Neodymium drivers . Ergonomically designed large over-the-ear swivel cups . Supreme sound isolation .Accurate sound reproduction . Minimal bleed . Sturdy and durable steel headband and arms . Soft leather headband cover . Interchangeable leather and soft suede ear cups covers included . 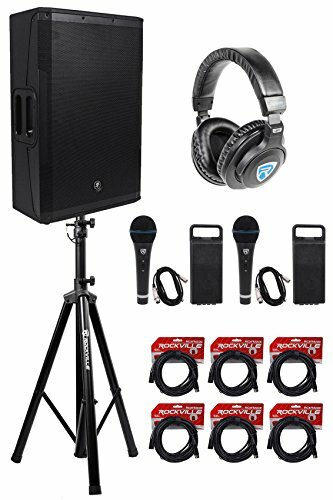 Rockville RVES05 Adjustable Tripod DJ PA Speaker Stand . (1) Stand included. Adjustable Height. Steel Construction with Nylon Clutch and Base. Black Color. Weight Capacity: 100 lbs. Adjustable Height Range: 71 inches. Base spread: 0-23 inches . Tube Diameter: 1.38 inches. Leg Diameter: 1.38 inches. .